An easy circuit to build suitable for beginners – it can be built on an electronic breadboard. This video shows the circuit operating. The circuit can be powered from a 9V battery but should also be able to operate over a range of voltages from 5V to 12V. The tri-colour LED used in this circuit is a three pin LED containing two LEDs in a single LED package that is capable of displaying three different colours. One LED is red, the other LED is green and when both LEDs are switched on at the same time, the LED displays a mix of the two colours which has an orange appearance. The above circuit only switches one LED on, then the other – never the two LEDs on at the same time, so only displays red and green. The specific tri-colour LED shown in the video (and below) is a Kingbright L-59EGW LED bought from RS components (RS part number 228-5764), but there are many other tri-colour LEDs available that will work with this circuit. 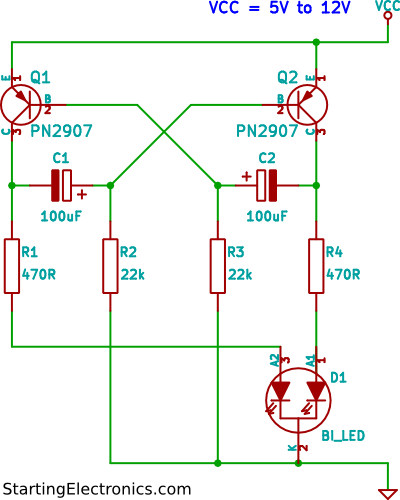 Make sure that you buy a common cathode tri-colour LED to use with this circuit. There seems to be some confusion about naming of tri-colour and bi-colour LEDs. This LED can display 3 colours and would normally be called a tri-colour LED (tri-color - American spelling), but the datasheet actually calls it a bi-polar and bi-color indicator lamp. A bi-colour LED is normally a two pin device that contains two LEDs. When current flows in one direction through the device, one LED switches on and the other off; when the current is reversed, the opposite LED is switched off and the other on.